What is the difference between inflammatory arthritis and non-inflammatory arthritis? What does it mean when someone has osteoporosis in contrast to osteoarthritis? Is spondylitis different from spondylosis? Why do some have rheumatoid arthritis and others rheumatic fever? Is medical terminology confusing you especially when it comes to joint disease/ rheumatology? In the following article I will explain some of the medical tongue twisters that had baffled patients for decades! First let’s analyse the word ‘arthritis’. Arth refers to a joint in Greek language. “itis”means inflammation of any part of the body. Therefore, arthritis refers to inflammation of joints. What is inflammation? Simply, this is swelling of a part of the body with excessive blood supply to that region. There are four features seen during inflammation which are redness, increase in warmth, pain and swelling. This was explained way back in first century AD by Roman scholar Celsus using the terms rubor(redness), calor(warmeth), dolar(pain),tumor(swelling). But does the term arthritis always mean inflammation of joints in the modern era? Unfortunately, not. We now tend to use this term for “anything that relates to joint disease”. For an example there is a variety of non-inflammatory arthritis called osteoarthritis as well. So what is non inflammatory arthritis? This is when a patient has a joint related condition causing agony without swelling, redness and warmth. Osteoarthritis which was previously known as wear and tear arthritis is the best example for non-inflammatory arthritis. Nevertheless, there is a considerable amount of overlap in these conditions and every patient has to be assessed for their unique joint ailment. There are numerous ways of treating osteoarthritis. The hallmark of this condition is loss of cartilage between the bones (or knees). When this happens the shock absorbent properties of especially joints like the knees, hips are lost. Finally bone grinds against bone and causes very severe pain. Contrary to the popular belief there are many ways to stop this process of osteoarthritis. Some methods do not involve tablets or injections. Osteo refers to bone. Porosis is a porous condition where the bone loosed its natural strength. Hence osteoporosis is weak and brittle bone without its normal strength to withstand shock. Osteoporosis is a common condition in the elderly population of Sri Lanka. The ideal way of diagnosing osteoporosis is to do a bone density scan called DXA scan. Depending on the test results we start the patients on tablets like Alendronate to strengthen the bone. Do you recall seeing hunched back elderly struggling to mobilise themselves with walking sticks? Unfortunately, these patients have severe osteoporosis with multiple wedge fractures of their spine making their back C shaped. There are ways to prevent osteoporosis as well. A good diet enriched in calcium and Vitamin D, plenty of exercise and skin being exposed to sunlight are some of these methods. The DXA scan now an essential screening test in the elderly, can also detect osteo-penia. Penia refers to “lack of” or deficiency. Osteopenia is not so bad as osteoporosis. Osteopenia could be easily treated with calcium and vitamin D supplements. Then what is Osteomalacia? This is softening of bones due to Vitamin D deficiency. Symptoms are bone pain and muscle weakness. Again treatment involves Vitamin D supplements. Spondy is spine. As I mentioned above ‘it is’ is inflammation. So spondylitis is inflammation of the spine. Although inflammation in ancient medical terms refer to redness, warmth, pain and swelling, when it happens in the spine almost all of the features cannot be seen externally. 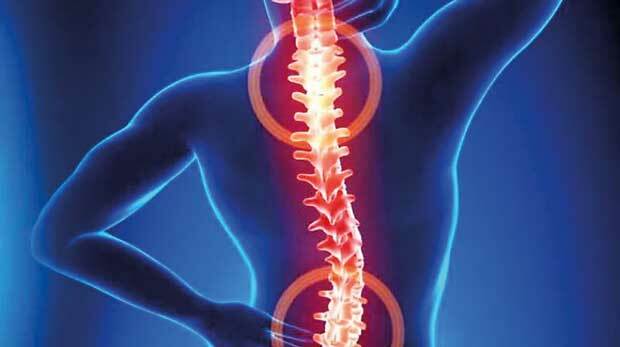 But similar to inflammation of a joint, the entire spine can undergo a change. Out of several varieties of spondylitis ankylosing spondylitis is a popular disease. Akylosis is fusion of bones. So ankylosing spondylitis is where the spine bones undergo both inflammation and fusion. For spondylitis which is seen more in males than females, we treat with anti-inflammatory medication and disease modifying drugs. As the longer the inflammation is, the more damage the spine receives. Spondylitis sometimes runs in the family. And can involve other joints like hips, knees or fingers. So how does spondylosis differ from spondylitis? ‘Osis’ is problem or disease. So spondylosis is a problem of the spine. Cervical spondylosis is a condition affecting the neck part of the spine. Lumbar spondylosis is when the lower back region is affected. In spondylosis the spinal bones (vertebrae) undergo significant wear and tear. And then this begins to affect close by nerves causing symptoms. Rheumatoid arthritis and rheumatic fever are two different conditions. Rheumatoid arthritis, as the name implies, affects the joints and causes inflammation. Rheumatic fever is a condition affecting almost several areas in the body after an infection. In rheumatic fever, joint pain/swelling is seen for a limited time, but there are certain other features like heart involvement, skin nodules, rashes, fever and abnormal body movements called chorea. This condition prevails mainly in children and young adults. The treatment is completely different from what’s used for rheumatoid arthritis. Rheumatoid arthritis is the commonest inflammatory arthritis in the world affecting more women than men. This produces symmetrical joint pain/swelling and on the long run causes deformed/crooked joints. Hand, wrist, elbow, shoulder and knee involvement is common. Early morning pain in the joints and stiffness lasting for one hour or more is characteristic of rheumatoid arthritis. Sometimes when I inquire into past events of patients, they come up with a history of childhood rheumatic fever and penicillin antibiotic treatment. I make it a point to explain that rheumatic fever bears no relationship to rheumatoid arthritis. Finally, to conclude this article on an interesting note, I would like to pose our readers a question as to what disease did the “Hunchback of Notre Dame” have? You might have read this famous novel by Victor Hugo. So was Hunchback (named Quasimodo) a true person? What really caused the main character in this novel, to have a hunched back/spine? There is an interesting debate among medical professionals regarding this. First of all, it is thought that Victor Hugo was inspired by a stone mason who was working at Notre Dame cathedral to write this world famous classic. That stone mason had a disease causing a hunched back. And also a skin condition with polyps covering his eyelids. An abnormally shaped disfigured head. There are three possibilities for Quasimodo s hunched back, which are osteoporosis (causing a spinal hump named Dowagers hump), tuberculosis of the spine (Potts disease) and neurofibromatosis. Out of these three neurofibromatosis is the condition which the stone mason (and the hunch back of Notre Dame) was thought to have! Neurofibromatosis causes the disfigured spine/ skull and also the skin protrusions/ polyps.